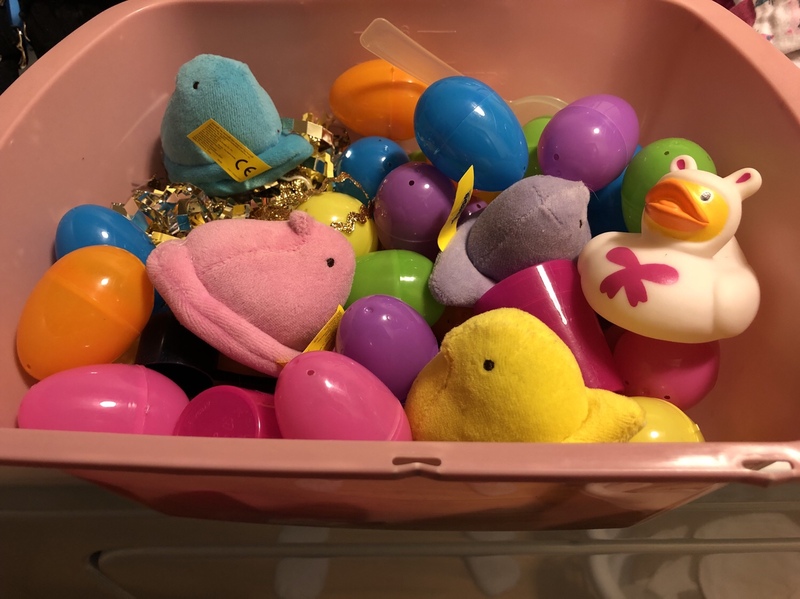 Yesterday, my brother set up an Easter egg hunt for Rosebud so there were plenty of eggs to use for a sensory tub. She’s been playing with these eggs all day so I wanted to find more interesting things she could do with them. In my house, it’s never been Easter without Peeps so I figured why not put these little guys in with the eggs. This way Rosebud can enjoy the peeps without all that sugar! I added the scraps of ribbon so she could make nests for the chicks, but most of it went on the floor. Luckily, she understood my explanation of how we can’t have ribbons on the floor because the cats will pick them up and get sick. After explaining this a couple of times, she understood so when she noticed she dropped some ribbon, she was quick to pick it up. Next I brought over a small basket and a large mixing spoon. We started transferring eggs from the tub to the basket using the spoon. Rosebud did this several times. This is a great activity for fine motor skills and coordination. We also discovered that the mini duckies fit into the eggs so we had some hatching ducklings. Then we made nests for both the chicks and the ducks and Rosebud poured all the eggs on top of them for good measure. She loves these new activities and I enjoy planning and doing them with her. It’s exciting to watch her make new discoveries and be delighted by the smallest things.